Integer operations confound middle schoolers everywhere. And understandably so. After all, imagine that everything you thought you knew about addition was suddenly turned on its head: numbers start moving the "wrong" way on the number line, adding two negatives gives you a smaller sum, and combining two integers with different signs can look a lot like what your teacher use to call subtraction. A lot of the issue stems from students being given rules and memorizing them instead of discovering and making sense of them. Since math is the study of patterns, students need space to explore the patterns that happen when you combine positive and negative numbers. Manipulatives like two-color counters and number lines are a pre-requisite to working with naked numbers. So after those experiences, I think Google Sheets provides some interesting possibilities. I'm still working through the best way to do this, but a spreadsheet with pre-formatted functions seems like a good space for students to experiment with plugging in numbers, seeing the outcome, and deriving the patterns. It's sort of like a science lab for math: students input, observe, tweak, generalize, and then make meaning of their discoveries. In other words, they think like mathematicians. Take a look at the Sheet below and let me know how it could be changed to help students understand integer addition. And if you'd like, make a copy for your Drive and mess around with it on your own. If you're using Google Classroom, attach the Sheet to an assignment and set to "Every student gets a copy." Students enter positive or negative integers in row 2, columns A and C. Anything positive will format green, negative as red to emphasize patterns. The sum will calculate automatically. Next they'll use the dropdowns in columns G-J to answer the questions about the signs of the addends. This emphasizes two things: first, if addends have the same sign, the sum will have the same sign as well. Secondly, if addends have different signs, the sum will have the sign of the number with the greater absolute value. If the addends have different signs, columns K-M will be populated with the absolute value of the addends and the sum. Students need to think about how the absolute values of the addends are related to the absolute value of the sum, then select their answer from column N.
Repeat steps 2-4 and fill in the remaining equations. When students have completed the Sheet, have them discuss the patterns they observe with a partner (try these Accountable Talk posters from Education to the Core to get the conversation started). Finally, have students go to the "Questions" sheet and explain their discoveries. Again, this is totally a work in progress and feedback would be great. I just think there's great potential in Sheets to help students experiment with math concepts and start thinking like mathematicians. It's definitely worth exploring. A teacher came to me last week looking for a way to quickly see the changes in her weekly student assessment data. She had been scoring each quiz, giving feedback to students, then calculating the percentage increase/decrease for each student by hand. The Google Sheet I created for her calculates the student's percent change from one week to the next, then highlights increases in green and decreases in red. It's a simple way to see how students are doing without having to bust out the calculator every Friday afternoon. If you're interested in peeking under the hood at the functions and conditional formatting that make it run, I've listed them below the embedded Sheet. Want to use it? Make your own copy and add it to your Drive by clicking here. Happy tracking! In the Change column, the formula for finding the percentage is to take the current week minus the previous week, then divide it by the previous week. I used =sum(-C2,E2)/E2 to make that happen. I made the previous week's score negative so that if the second week's score is lower, it will return a negative value and show a decrease in the form of a negative percent change (as in a larger negative plus a smaller positive equals a negative). In retrospect, there's probably an easier way, but I'm still pretty new to spreadsheets and that's the integer rule that came to me in the moment. When there's no score for the previous week, the function above returns the ever-so-irritating "#DIV/0!" to remind you of what you've known since 2nd grade: you can't divide by zero. I didn't want that showing up in the change column for the weeks that hadn't happened yet, so I used the IFERROR function. IFERROR let's you decide what shows up in a cell if there is an error (clever, right?). To use it, surround the original function inside IFERROR parentheses, then after the comma in quotation marks, put what you want to show up instead of the error message. In this case, I wanted it to show up as "N/A". So the function in the Change column ends up looking like this: =IFERROR(sum(-C2,E2)/C2,"N/A"). In other words, if there's an error when the Sheet runs the sum function, just stick an "N/A" in that cell instead. Emphasizes, in green, an increase from the previous week to the current week. This hides an unfortunate byproduct of the function in the Change column which returns "-100%" if there isn't a value in the current week. The only way this formatting could be a problem is if a student gets a 100 one week and a 0 the next, the change won't show up. If you know another way around this, let me know. Emphasizes, in red, a decrease from the previous week to the current week. This makes the "N/A" from the IFERROR function less obtrusive when you're looking at the entire sheet and lets you focus more clearly on the data. We all know that school districts often purchase technology with no real plan in place for teacher professional development. Those of us in the Edtech community beg for more time to train and support our teachers, but even then those trainings end up taking the form of one-time, sit-and-get workshops with little to no follow-up. 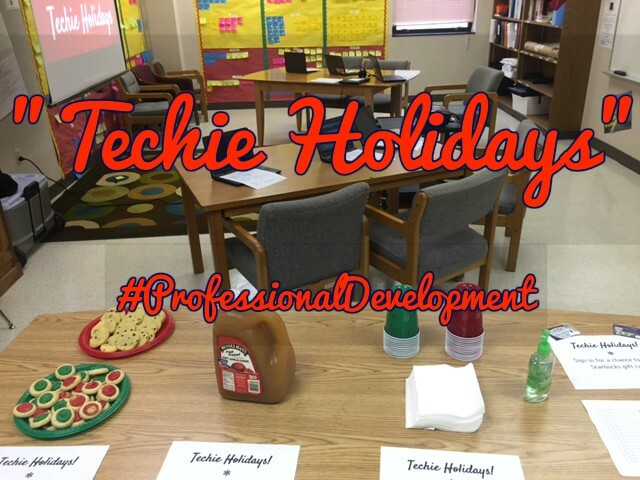 As I conducted research for Master's thesis, I focused on the components of effective edtech professional development. 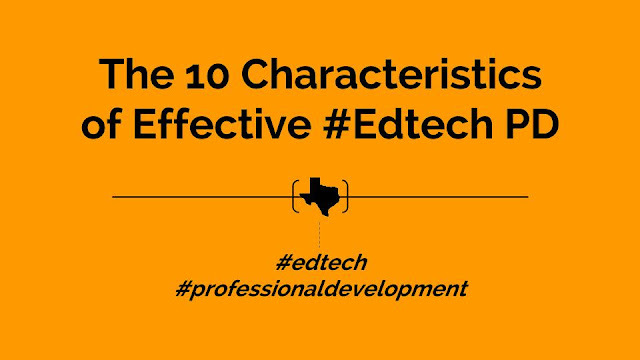 After organizing notes from a multitude of peer-reviewed articles, I synthesized the top 10 characteristics of effective PD based on their mentions in the literature. The most frequently mentioned characteristic of effective PD is that it has a clear link to a teacher's content area and their classroom practice. To accomplish this, we may need to restructure the way we present PD so that teachers can be clustered together based on content areas. We may also need to consider blending our PD so we present a whole group, face-to-face session on the general functions of a digital tool, then allow teachers to choose an online pathway that walks them through the applications of the tool in their content area. Whatever route we choose, the adult learner is focused on practical application and learns to solve problems, so we need to make sure we provide clear connections to their daily context. The duration of effective PD includes both an extended span of time to implement the new learning as well as a high number of contact hours outside of the initial session. One-time workshops are ineffective in changing teacher practice, especially when there is little to no follow up outside of the training. Positioning our training in the context of regularly scheduled Professional Learning Communities (PLCs) or other forms of job-embedded PD allow us to extend the contact time we have with teachers and support them in their new learning. The teacher's support shouldn't also be the teacher's evaluator. This is where the role of coaches comes into play. The teacher has to feel that they have a partner in implementation who will respect their need for confidentiality as they incubate new ideas and attempt to execute new plans in their classroom. Often, if we were the teachers in our own PD, we'd be checking Facebook too. If we're not doing our part to model active learning and engaging instruction, we have no one to blame but ourselves for the slack-jawed faces staring back at us. Teachers need "sandbox time" to experiment and play with new technology, and it should happen during our sessions where we can provide structure, guidance and support. With our current Chromebook pilot, we made assumptions early on that teachers would understand how to use the devices. Based on that assumption, we moved to quickly into digital tools without making sure teachers could navigate their way around a different interface than what they were use to. Teachers need to experience the actual classroom technology to understand what student's will experience as they use the tools. Additionally, greater learning transfer will happen if what teachers experience in training matches what they will be using in the classroom. I've been out of the classroom 8 months (and here are some lessons I've learned). In the eyes of a teacher, I'm out of touch. Whether that's true or not, perception can quickly become reality. The more we can get classroom teachers presenting the PD and sharing what they do with real live students, the more buy-in we'll have from the teachers we're training. How does your campus or district show support for your early adopters? Do they allow them to take risks, make mistakes, and blaze a new trail? Or do they flog them at the first sign of a data dip, blame the devices, and remove the technology from the classroom? For PD to be effective, teachers must feel they have the support of the broader institution to take the often uncertain path of pushing through to new and higher levels of learning. Exit surveys are an awful way to evaluate professional development, but that seems to be our default method to determine if PD has been effective. To truly evaluate and refine our PD, we need to find ways to see if what teachers have learned is reaching the classroom, changing teacher practice, and impacting students. How do we do that? I'm not sure. There are so many variables that go into effective teaching that it becomes difficult to tease out exactly what is making an impact. If anyone is using metrics to measure PD that are working, I'd love to hear about it in the comments section. We've all walked out of training sessions that were a complete waste of our lives. So for PD to be effective, the teacher has to feel like the time they just put in will result in positive changes in their classroom. It's incumbent on us as facilitators to make sure that connection is clear, so that when teachers leave our initial face-to-face, they have plans for immediate implementation with their students. That's what the literature says. What would you add to the list?